What is a Positive Displacement Pump? 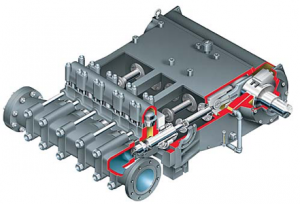 » Articles » What is a Positive Displacement Pump? Here, PIF provides a definitive guide to positive displacement pumps. From the principle of their operation and characteristics, to the various different types of positive displacement pumps and their primary advantages. Let’s begin by explaining what a positive displacement pump is. Positive Displacement pumps are generally used for specialist applications such as for pumping viscous liquids or liquids that contain suspended or fragile solids. These pumps are typically not capable of such a high flow rate as say, a centrifugal pump, but they are capable of producing much higher pressures. A positive displacement pump makes a fluid move by trapping a fixed amount of the fluid and forcing (displacing) that trapped volume into a discharge pipe or discharge system. In application, a positive displacement pump must not be allowed to operate against a closed valve on the discharge side of the pump, because it has no shutoff head like a centrifugal pump. With the pump operating against a closed discharge valve, it will continue to produce flow and the pressure in the discharge line will increase until the pipeline can either fracture or the pump can become severely damaged, or both. To prevent this, a relief or safety valve on the discharge side of the positive displacement pump is therefore often necessary. This relief valve can be positioned either internally or externally to the pump. The pump manufacturer normally has the option to supply internal relief or safety valves. An internal valve is usually only used as a safety precaution, but an external relief valve in the discharge line, with a return line back to the suction line or supply tank will provide increased safety. Viscosity limits vary with pump type. These include gear, screw, vane, peristaltic, lobe, and progressive cavity and they all use rotating parts to move the liquid into and out of the pump chamber. 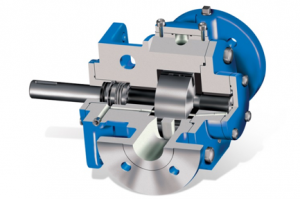 Some rotary pumps, such as gear pumps, must have very tight clearance between the rotating elements and the walls of the chamber, and between the rotating parts, which means they generally can’t be used to pump large solids or abrasive fluids that may wear the parts. Other types such as lobe pumps and progressive cavity pumps are designed to move liquids containing solids. Including plunger, diaphragm, piston, hydraulic, and many others - use a repetitive reciprocating mechanism to expand and contract the chamber at regular intervals. Reciprocating pumps incorporate one or more sets of check valves at the inlet and outlet of the pump to help guild the liquid through the pump and to prevent reverse flow. The chain pump is a type of water pump in which several circular discs are positioned on an endless chain. One part of the chain dips into the water, and the chain runs through a tube, slightly bigger than the diameter of the discs. As the chain is drawn up the tube, water becomes trapped between the discs and is lifted to and discharged at the top. A diaphragm pump is a particular type of positive displacement pump that uses the reciprocating action of a flexing diaphragm to move fluid into and out of the pumping chamber. The flexing diaphragm creates a vacuum at the inlet of the chamber that draws the fluid into the chamber. When the diaphragm moves in the opposite direction, it causes the volume of the pumping chamber to decrease, forcing the fluid out the discharge port of the pump. Diaphragm pumps use check valves at the inlet and outlet of the pumping chamber to ensure that the fluid flows in one direction and out the other without leaking backwards. In general, positive displacement pumps are ideal for applications where a constant flow is needed. They create medium to high pressure and are often an excellent way to pump oils and other viscous fluids. Positive displacement pumps are also extremely useful for applications requiring a combination of low flow and high pressure. For example, to move fluids containing suspended or fragile solids. So, that is an overview of Positive Displacement Pumps. Do you have anything to add? Any advantages or disadvantages in an application? Or is there anything we didn't cover which you would like to know? Either leave your comments below, click here to ask us a question, or give us a call on +44 (0) 8707 66 77 78.